Background: Venom peptides are a proven resource for identifying novel drugs, however the process of identifying bioactive venom peptides is currently labor intensive, costly, and rarely results in pharmaceutical success. As venom peptides are modulators of ion channels and receptors their potential for manipulating cell signals in diseased states are unique and offer an untapped resource for finding new medicines. Recent advances in -omic technologies, and microfluidic biosensing systems have transformed how venom peptides are discovered and characterized. 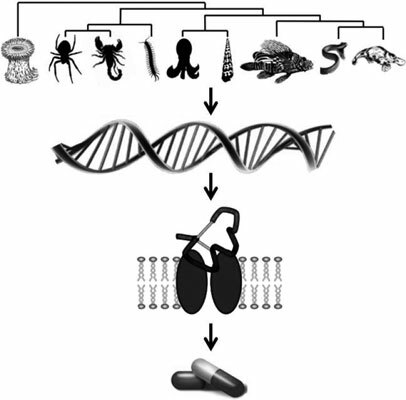 Conclusion: This review will cover past, present and future approaches for screening venom peptides for drug discovery and development. Specifically, we will highlight online high-resolution microfluidic biosensing systems and new fluorescence detection methods that can be adapted to expand the discovery and characterization of venom peptide drugs. Keywords: Venom, peptides, microfluidics, drug discovery, biosensing, bioassays, high-resolution screening. Keywords:Venom, peptides, microfluidics, drug discovery, biosensing, bioassays, high-resolution screening. Abstract:Background: Venom peptides are a proven resource for identifying novel drugs, however the process of identifying bioactive venom peptides is currently labor intensive, costly, and rarely results in pharmaceutical success. As venom peptides are modulators of ion channels and receptors their potential for manipulating cell signals in diseased states are unique and offer an untapped resource for finding new medicines. Recent advances in -omic technologies, and microfluidic biosensing systems have transformed how venom peptides are discovered and characterized.